Water shades and sunglasses protect your eyes from the sun and water. Many water shades have integrated straps that go around your head to stop them from falling off while you ride or when you crash. If you choose to wear your sunglasses on the water we suggest a pair of retaining straps. We also carry protective cases to keep your shades scratch-free while off the water. Rash guards, water jerseys, and water shirts do a lot for you. They protect you from the harmful rays from the sun and also stop harness rash. If you kite as much as we do, you�ll need this extra protection from the elements. We carry all your favorite brands: Ozone, Crazyfly, Kiteboarding.com, and Dakine. These neoprene jackets and hoodies will keep you toasty on and off the water by cutting the wind chill factor. Oversized and warm, they are great for warming up after your session or while taking a break. Hyperflex and Prolimit know what it takes to keep you warm. Safety in kiting is very important, especially when learning how to ride or a new trick. Impact vests protect against hard landings on the water from a missed jump or hard fall while flotation vests help keep you afloat in deep water. These vests give safety and peace of mind. We have a huge Selection of booties from O'Neill and Rip Curl. Booties not only protect your feet sharp rocks, coral reefs, or oyster shells, but they are also designed to keep your feet nice and toasty. We have a booty for everybody. Gloves keep your hands warm in the coldest conditions and you can't kite if you can't feel your bar or what the kite is doing. We carry gloves from O'Neill, Rip Curl, Neil Pryde, and Dakine. Gloves are a must when you are still frothing to kite once it gets cold. Most of the heat in your body escapes through your head, which is why beanies are so popular and a must when the temperatures start to drop. You can't wear a regular beanie on the water, so get a warm neoprene beanie to keep your body toasty in those frigid conditions. 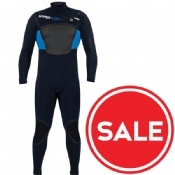 O'Neill, Prolimit, Neil Pryde, and Rip Curl are the leading manufacturers. When the summer heats up it�s great to have a water hat to help protect your head and face from the sun. Water hats have a handy chin strap to keep the hat securely on your head while out riding or in case you crash.